When you’re viewing Spotify Mobile tracks in a playlist, album, or search result, you can take advantage of some groovy moves that can help you perform some important actions with ease. Add a track to your Play Queue. Add the track to a playlist. 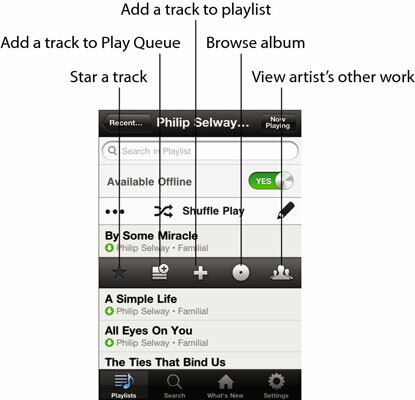 Browse the album on which the track appears. View the artist’s other work (confusingly, represented by a group of people, even if it’s a solo artist). 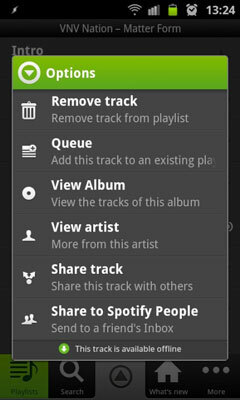 Remove a track from your playlist. Share the track with others. A Star option doesn’t appear in this group because you can star a track by tapping the empty star symbol next to the track listing. Android phones also let you display a number of handy Spotify widgets (mini-apps that give you quick access to certain features). Here is a mini-Spotify controller that displays the currently playing track; a folder of starred tracks; and a Search text box. 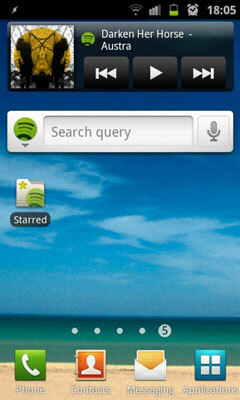 These widgets are really convenient because you don’t need to have Spotify open all the time to use them!